UPDATE 1200 GMT: Bashar al-Assad has dismissed US Secretary of State John Kerry’s remarks that political negotiations are essential, with the President at the table. Declarations from outside do not concern us. We are still hearing the declarations and we should wait for actions and then decide. Syria’s State media is celebrating mis-reporting by Western counterparts of a garbled statement by US Secretary of State John Kerry about the necessity of political negotiations to end the four-year crisis. State news agency SANA proclaims, “Kerry Acknowledges that the US Will Have to Negotiate with President al-Assad to End War in Syria”. The Syrian propaganda is in line with headlines in the West, including on the BBC and Al Jazeera, such as “Kerry Says US Willing to Negotiate With Syria’s Assad“. The implication, on both sides, is that the US may have dismissed its previous line and accepted Assad’s stay in power: “Kerry did not repeat the standard US line that Assad had lost all legitimacy and had to go”. In fact, the US Secretary of State never indicated that negotiations were a step-down for the President’s continued rule. He said only that pressure was needed to bring Assad to the table so a political resolution — with or without the President was not made clear — could be reached. See Syria Analysis: Kerry’s Ambiguous Statement — Is US Preparing to Accept Assad’s Stay in Power? 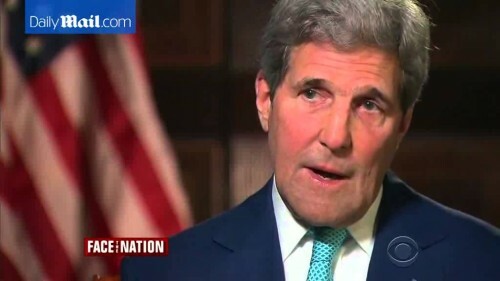 However, Kerry’s ambiguity — whether deliberate or a garbling of the long-standing American position — left open the way for Syria and its allies to declare a victory over the US, even if the Secretary of State was trying “to deny the fact that his administration is responsible for hindering the reaching of a political solution”. And the US media is unlikely to check that celebration. This morning, The New York Times explains, “Kerry Suggests There Is a Place for Assad in Syria Talks“.